Amir Khan says being an underdog for the first time as a professional will motivate him against Saul 'Canelo' Alvarez in Las Vegas on 7 May. Khan is jumping two weight classes to fight for his rival's WBC middleweight title, at a catchweight of 155lb. The 29-year-old Briton believes his superior speed will be decisive. "For the first time I'm fighting someone who is heavier and also a bigger name, but that will bring the best out in me," said Khan. "Normally I'm the one who is supposed to win the fight and that puts a lot of pressure on you. This time I don't feel that pressure." Khan, who weighed in at 147lb for his last contest, says he has felt "strong and explosive" during training and believes he may be fighting at his ideal weight. What makes the perfect punch? "A lot of people think I won't be strong or big enough for this guy," he said. "But at middleweight I will get to hold onto my muscle and my strength. "The speed is still there too - I've not lost it by putting on more muscle. "If I was just going to stand there and trade, this would not be a good fight for me. But guys who move well give Canelo big problems. And that is what I do." 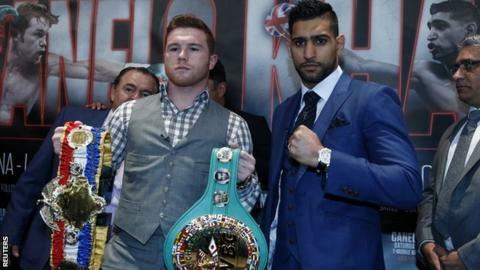 Alvarez and Khan came face to face at a news conference in London on Monday. Their three-city promotional tour will also take in New York and Los Angeles. Their fight will take place at the new 20,000-seat T-Mobile Arena, just off the Las Vegas Strip. Khan has not been in a world title fight since he was knocked out by Danny Garcia in 2012 and has had only three fights as a welterweight. It was, therefore, a big shock when he announced he was stepping up to face Mexican superstar Alvarez, who has been campaigning at light-middleweight since 2010. Alvarez, whose only defeat in 48 pro fights was against Floyd Mayweather in 2013, beat Puerto Rican great Miguel Cotto in his last fight to secure the WBC middleweight title. However, that fight was at a catchweight of 155lb - only one pound above the light-middleweight limit - an arrangement that will be repeated against Khan. But Khan was sceptical about Alvarez's claim he would only weigh 165lb on fight night, and speculated his opponent would be at least eight pounds heavier. Alvarez, who turned pro as a 15-year-old in 2005, said he was surprised Khan took the fight, but added he expected his rival to give him problems. "He's one of the top fighters in the world, very fast and with great boxing ability. There will be some very difficult rounds for me," said Alvarez. "But at the same time he's aggressive and likes to fight. That's good for me, because I like to fight as well." Former six-weight world champion Oscar de la Hoya, who promotes Alvarez, said the fight reminded him of the 1987 classic between Sugar Ray Leonard and Marvin Hagler, in which the former's speed trumped the latter's size and power. "In fights between speed and power, speed normally prevails," said De la Hoya, who also confirmed there was a rematch clause in the contract, which was put together in less than a week. "But Amir is also a strong fighter, so we can't underestimate his power. I was shocked to see that they are the same size. "People are in for a great fight. When has Amir Khan been in a dull fight?" Meanwhile, Alvarez confirmed negotiations were already under way for him to fight WBA and IBF middleweight champion Gennady Golovkin. Kazakhstan's Golovkin, who has 31 knockouts from 34 pro contests, fights American Dominic Wade on 23 April.